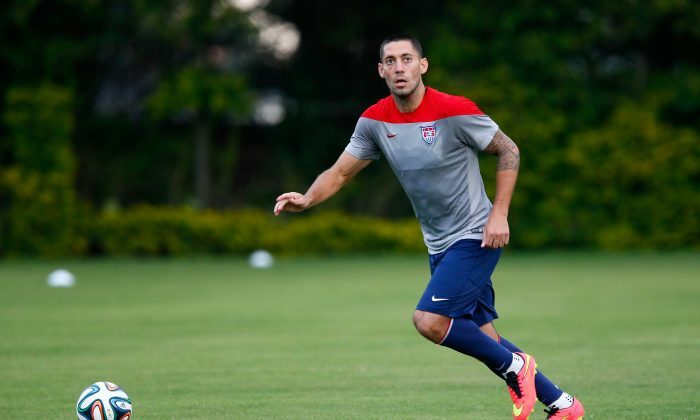 Clint Dempsey Salary 2014: How Much Does Seattle Sounders, USMNT Forward Make? How much does Clint Dempsey make? The 31-year-old USA international will make $6,695,000 in 2014 by playing for the Seattle Sounders. According to the MLS player salaries list, Dempsey is the highest paid player in Major League Soccer (MLS). However, Dempsey doesn’t have the highest base salary. That honor goes to his Team USA team mate Michael Bradley, who is paid $6 million as a base salary for Toronto FC. In contrast, Dempsey “only” makes $4.913 million as a base; bonuses make up the rest of his income. Still, that what Dempsey earns at Seattle is less than what he used to make playing for Tottenham Hotspur in the English Premier League in 2013, which is about $7.4 million. MOGI DAS CRUZES, Brazil (AP) — Highly physical, probably defensive and anxiety-ridden for sure. Not exactly the kind of happy football that fans have enjoyed so far at the World Cup, but it’s the likely scenario for Tuesday’s second-round match between Belgium and the United States. The stakes certainly are high enough. Belgium has not reached the quarterfinals since 1986 and the U.S. team has already exceeded expectations by emerging from a tough opening group and wants to ride that momentum. That was after the Americans played three grueling games in the Amazon jungle and Brazil’s tropical northeast coast. The U.S. finished ahead of Portugal and Ghana, taking second place in Group G behind Germany. Tuesday’s winner will face either Argentina or Switzerland in Brasilia on July 5. With support reaching fever pitch back home, American players realize the increased attention that comes with each match is an opportunity not to be missed to promote the sport in the United States. “We want to obviously do well for ourselves, for our country, but it’s a big step for the growth of soccer if we get past Belgium,” U.S. defender DaMarcus Beasley said. Getting past Belgium is no easy task. So far it has conceded only one goal — a penalty at that — in three games. And in Thibaut Courtois, the team has arguably the most exciting young goalkeeper in the world. While team captain Vincent Kompany has been excellent in the two games he’s played, the central defender has been struggling with a recurring groin strain and is a doubt for Tuesday’s game. Another starter, Thomas Vermaelen, has a hamstring injury and has resumed individual exercises. Whether he can play or not will be another last-minute decision. Add to that the cracked fibula of right back Anthony Vanden Borre and an abductor strain for Laurent Ciman, and Wilmots could be in trouble. Belgium has treaded extremely carefully to line up three one-goal victories and emerge from its group with a perfect record. Holding back, avoiding errors and pouncing late has become its mantra, and if fans deplore the lack of joy — too bad. The satisfaction of beautiful football cannot match the thrill of victory. And since the U.S. offense has often been anemic, don’t bet on much of a goal-fest. In the last two games, Klinsmann opted for a formation with five midfielders to feed lone striker Clint Dempsey. Jozy Altidore, the top American forward, has been sidelined since straining his left hamstring in the first half against Ghana and has been training on his own. The U.S. hasn’t played Belgium in the World Cup since winning 3-0 in its opening match of the very first tournament in 1930.